הפוך פנדה יושבת על ענף במבוק והמילים "10Yuan 30 g Ag 999"
פנדה יושבת על ענף במבוק והמילים "10Yuan 30 g Ag 999"
מטבע כסף פנדה סינית משנת 2017 משקל 30 גרם Buy a 30 g Chinese Panda silver coin at the lowest price online in our store. Very popular pure silver coin with limited mintage, we ship worldwide. 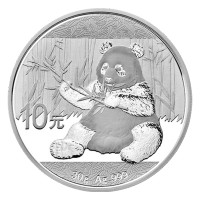 The 2017 silver panda reverse design depicts a seated panda bear holding a bamboo branch with a bamboo forest in the background. The obverse features the Hall of Prayer for Good Harvests (The Temple of Heaven), the title of the People's Republic of China in Chinese characters, and the year 2017. This coin is legal tender of the People's Republic of China. This beautiful release continues a tradition which began in 1983.